Welcome to IPCVision "Born-Again Biking" Page! I cannot miss my way. I breathe again!" Tired of the daily routine of earning a living? Tired of being ground down by the financial responsibilities of modern living? Go wild - you deserve to spend some of that hard earned money on yourself!! Break free - smile - breathe in the fresh air - smell that scenery - "Capture some Freedom" - go cruisin' into the sunset! After 25 years without a bike (the last one was a Velocette - more of that later) - the time had come to get back into biking - I just HAD to have a bike! So, I took the plunge. An Accountant would have argued that I didn't really NEED one, but emotion ruled - after all, if such decisions of the heart were left to accountants, we probably wouldn't be exploring space!! It is a self-evident fact that you have more chance of dying or being seriously injured if you ride a bike than if you drive a car. However, with good roadcraft and considered riding - anticipation being key to survival - you can minimise your personal contribution to these risks, albeit that the cold hand of "unlucky fate" waits, poised above us all. Bike with care! I bike purely for pleasure, and on the whole can choose when to indulge - commuting or general transport is not on my agenda. 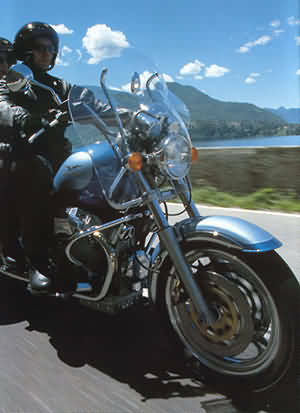 The bike is used primarily as a cruiser/tourer and it fulfils these objectives admirably. My interest in "superbiking" down the highway is minimal, my needs being a comfortable riding position, good view of the scenery, being able to load up with luggage and pillion, and generally having fun and enjoying the biking experience! However, don't let the "cruising" label fool you - this bike goes well, the 1100cc fuel injected engine pulling quickly up to over 100mph should the necessity arise. Also, depite being a heavy bike (~257Kg), with experience, which does take some time to acquire, it is suprisingly agile around even sharpish bends. Many "professional" Reviewers often look down their noses at this sort of "retro" bike - but that's probably the result of a youthful hormonal imbalance -it is a scientific fact that too much testosterone clouds the ability to make rational judgments! However, biking to me, and I believe a good many others, is more than speed and manoeuvrability. More realistic and balanced criticism indicates that it is a much overlooked bike. Perhaps this is because it does take time to get used to - it requires an extended "bonding" period! Interestingly, America's "Cycle World" voted it best Ameri-Cruiser in March 1998. Nevertheless, we are talking about a cruising/touring bike and it clearly doesn't compete with the sophistication in terms of speed and handling of the modern styled "superbikes", but it really depends upon what you want out of your biking. I just fell in love with the look, feel and sound of it - and the ride was just what I was after! This bike has that much sought after quality -"character"; and it sounds like a real bike too!! Also, the increased emphasis on quality control does seem to have produced a bike with a quality feel. As a small example of good design the screen and frame can be removed in 1 min - just four bolts to undo and the whole lot just lifts off....... gives one a feeling of real satisfaction! The only real problem I encountered with the bike as new was in changing up from first to second gear and second to third without loud clunk, the sympathetic mechanic at the local dealer informed me "Well, the gearbox is a little bit "agricultural" - it'll improve when it's bedded down a bit - after the first 5,000 miles"!! The mechanic was right, it has improved after 5,000 miles and I can now (mostly) change up in first and second with only the barest of clunks, and sometimes with the beauteous satisfaction of a mere snick as it slips up the gears. However, this, in my opinion, is not a comfortable busy city bike - first gear is a bit low, and second a bit high for slow stop/start traffic, so you end up continually changing up and down, which soon becomes a bit tiring. However, give it a more open road - now that's a different story. Other than the lower gears, I really can only find one other complaint. The warning bulbs on the instrument panel are a bit dim - and sometimes invisible in bright sunlight. This can cause problems with awareness of indicator flashers and low fuel. For the flashers, an audible warning would be beneficial. For those interested, here is the specification of the 1998 model. One of the benefits of owning a famous marque Italian motorcycle is the company you keep - the Moto Guzzi Club GB "continues to follow the proven formula of merging a quality magazine with a multitude of events and rallies that combine to actively encourage that special camaraderie which only owning and riding a Guzzi can bring". The bi-monthly magazine is an interesting read with views openly expressed on a wide range of motorcycling topics, past and planned biking events, etc - as well as the Club administration! The Moto Guzzi Club GB website provides a wealth of information and interesting links to other enthusiasts and official Moto Guzzi sites - go there! 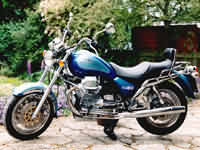 For some time in the 1980s and 1990s Moto Guzzi had been suffering from financial difficulties, which was inevitable seeing as their bikes relied on one basic engine block, tuned or configured for different purposes. It has been clear that to survive, development of a wider range of engines was necessary and internal arguments about how to achieve this ran for many years. Unfortunately, time was not on their side. 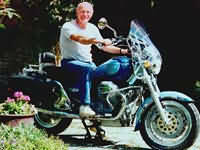 The full history of events can be found on Wikipedia - Moto Guzzi. The pace of change of modern commerce brought the take-over of Moto Guzzi (in April 2000) by another prestige Italian motorcycle company, Aprilia, who were then taken over by in December 2004 by Piaggio & Co. S.p.A forming Europe's largest bike manufacturer. Hence, the marque was in Italian hands, and money for the important R&D became available resulting in the emergence of a newer range of Moto Guzzis, alongside continuing refinement and improved operation of some of the classic designs. 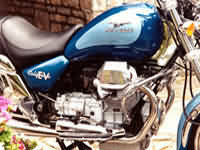 "The Moto Guzzi name is synonymous with aristocracy in the motorcycling world. It traces its roots back 85 years to the founding of the legendary plant at Mandello del Lario where the �Brand of the Eagle� was born in 1921. The range is currently being enhanced and new motorcycles added, which gains the brand entry into new market segments, both as regards the introduction of new typologies and in terms of the relaunch of classic bikes with exciting technical innovations. New touring versions of certain key models have also been created. In this process, Moto Guzzi energises its original spirit and incomparable heritage with the very best in available technology; it is noteworthy that the 2006 range fully complies with the Euro 3 regulations. The Moto Guzzi philosophy is based on two guiding principles: sheer driving pleasure and maximum attention to design. Even on roads which forbid the thrill of high performance riding, the Moto Guzzi experience quickly evokes intense sensations which may be savoured kilometre after kilometre. Indeed, Moto Guzzi incarnates a lifestyle which is contrary to the logic of haste and speed and which gives rise to real and powerful emotions: the joy of motorcycling enfolded in the steady throb of the twin cylinder 90� V engine � the real signature of the bike from Mandello �..Italian creativity and technology at their best. The new range reflects this philosophy and sets the pace as regards every facet of 21st century motorcycling. The spirit of �Touring� is captured by the Norge 1200, California Vintage, California Touring, and Breva 750 Touring models. The �Naked� segment is represented by the all-new Breva 1100 (ABS), Griso 1100, Breva 850, Griso 850, and Breva 750. Whilst the �Custom� bikes, which are an expression of pure freedom, are represented by the California and Nevada 750 Classics, Moto Guzzi�s sporting side is demonstrated in the MGS�01 Corsa, a recent winner at that most classic of American and world circuits, Daytona." Here is a review of a biking holiday I took (with wife as pillion) in Northern Spain, describing sites visited and conditions encountered. Please e-mail any comments or links you have to biking holidays and reviews you think would be of interest. 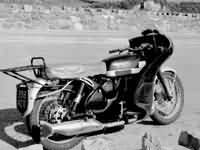 I last had a bike in the late 60's - a beautiful black Velocette Venom Veeline (touring fairing with side panels). 500cc of single thumping cylinder, valve lifter to assist with taking just over compression when kicking over, fishtail exhaust, the excellent touring fairing, and that "Oh!, so gorgeous" sound. It was in excellent condition, a 1962 model (but not registered until 1964 if I remember correctly). I recently found the sale receipt - it had to be sold in 1974 to pay for post-education debts - sad times! I received �95 for it, and that included a good helmet- it was sold through Sheldon Motorcycles on the Coventry Road in Birmingham, England, and Ray Bennet & Co.Ltd, the purchasers, drove a real hard bargain! I've recently been wondering if the bike is still around - if it went to a good home where it was lavished with love and attention! The registration number was 998 MOX, Frame: R. S. 18067; Engine VM (or VN) 5882. If anyone knows of its whereabouts, or history, I would be most interested to hear from them. Visit the developing Velocette Owners Club Website for an insight into the enthusiasm and esteem with which this quality classic motorcycle is held.